Halloween is always a great time to read Mary Shelley’s Frankenstein, but even more so this year, which marks the 200th anniversary of the initial publication of the landmark novel. Accordingly, the National Endowment for the Humanities and the Keats-Shelley Society of America launched “Frankenreads,” an international celebration of what is sometimes called the very first work of science fiction. The Kingfisher Institute for the Liberal Arts and Professions hosted a panel on Mary Shelley. Lucy Morrison, PhD, a professor of English at the University of Nebraska at Omaha, joined Creighton faculty members Matt Reznicek, PhD, of the Department of English, and Andrew Hogan, PhD, of the Department of History, for a discussion. 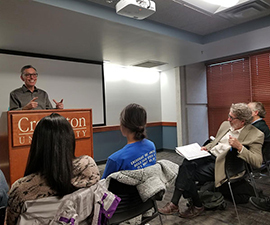 Guest lecturer David McNally, PhD, a well-regarded scholar from the University of Houston, gave a dynamic talk on Frankenstein in the context of the rise of capitalism. Patrick Murray, PhD, the John C. Kenefick Faculty Chair in the Humanities, arranged McNally’s visit. In a nod to the many film adaptations of the novel, the Mel Brooks classic Young Frankenstein was shown on campus. Prior to the film viewing, the Rev. Kevin FitzGerald, SJ, PhD, PhD, John A. Creighton University Professor and an associate professor in the Department of Medical Education, gave a presentation on current issues in bioethics. For the grand finale, Creighton hosted a daylong reading of the novel aloud in its entirety on Halloween. On the same day, many institutions, including the Library of Congress, also hosted read-a-thons as part of “Frankenreads.” At Creighton, about 30 readers, made up of faculty, students, staff and administrators – including Bridget Keegan, PhD, dean of the College of Arts and Sciences, and Creighton President the Rev. Daniel Hendrickson, SJ – read aloud almost continuously from 8 a.m. to 4 p.m. Finally, the talented winners of the writing contest received recognition – and cake. Creighton community members had been challenged to write their best short ghost story or poem. Frankenstein itself was written after friends Lord Byron, Percy Shelley, and Mary Godwin (later Shelley) challenged one another to see who could come up with the best ghostly tale. Winners of the present-day contest were Garret Fox, an English major, for his poem “Frankincense,” and Alyssa Hostert, also an English major, for her short story “A Forest Full of Stars.” Dannette Eveloff, a faculty member in the Doctor of Nursing Practice program, earned the runner-up spot. Also instrumental in Frankenweek were the University libraries. 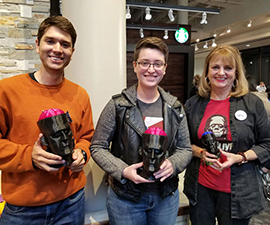 Library staff member David Buffington used the library’s 3D printers to create likenesses of the monster’s head with removable brains, which served as highly coveted prizes! 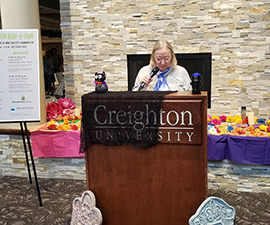 Frankenweek presented a great opportunity for collaboration across campus – in the spirit of celebrating not only great literature, but the many diverse talents and areas of rich expertise represented at Creighton.